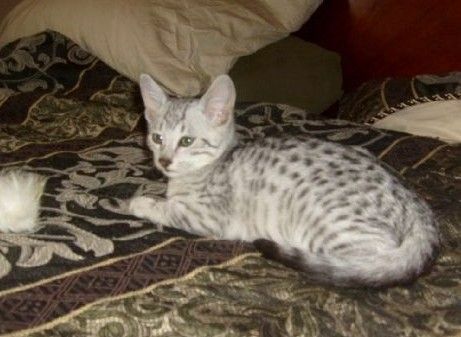 We have Egyptian Mau kittens year round. I specialize in amazing clear coated silvers ($850) but have lovely smoke ($550) & bronze ($600) babies available from time to time as well. Kittens come with CFA registration, shot record & if shipped their own kitty bed. I do ship world wide & show in CFA nation wide. Traveling to Virgina on Aug. 19th so delivery from Kansas to Richmond, VA or anywhere in route availalble now. Discounts on Smoke kittens Aug & Sept. only.